Flyweight pattern tries to reuse already existing similar kind objects by storing them and creates new object when no matching object is found. We will demonstrate this pattern by drawing 20 circles of different locations but we will create only 5 objects. Only 5 colors are available so color property is used to check already existing Circle objects. We are going to create a Shape interface and concrete class Circleimplementing the Shape interface. A factory class ShapeFactory is defined as a next step. ShapeFactory has a HashMap of Circle having key as color of the Circle object. Whenever a request comes to create a circle of particular color to ShapeFactory, it checks the circle object in its HashMap, if object of Circlefound, that object is returned otherwise a new object is created, stored in hashmap for future use, and returned to client. 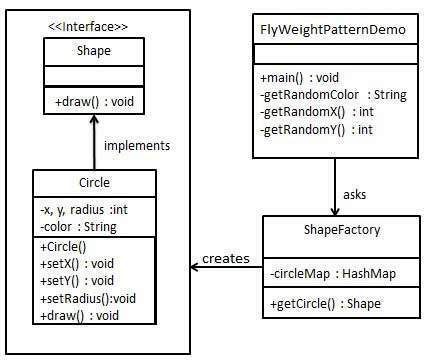 FlyWeightPatternDemo, our demo class, will use ShapeFactory to get a Shapeobject. It will pass information (red / green / blue/ black / white) to ShapeFactory to get the circle of desired color it needs. Create concrete class implementing the same interface. // javac *.java will compile properly. Use the factory to get object of concrete class by passing an information such as color.